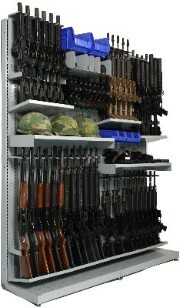 Combat Weapons Shelving Storage Systems are available on GSA Contract GS-07F-0661W as a woman owned small business set aside. Combat Weapon Storage Systems now available with Combat Weapon Tracking System. Components include saddles for barrels, horizontal mounts, bases for specific weapons, spare barrel supports, pistol pegs, adjustable shelves and bins for multiple storage requirements. All components can be configured individually for independent adjustability inside the rack, offering the maximum eficiency, adaptability and storage capacity in a small footprint. We also offer hand gun lockers for individual security requirements. Custom components are available to meet the changing weapon systems currently coming to market or for custom rack configurations.